Welcome to our new spotlight feature where we discuss characters who may not look “black”, as in have dark skin tone or can we trace their genetic line to prove they have black ancestors. Some of these characters I can justifiably include on the website because my research or based on interviews or conversations with the creators have yielded unequivocal proof that they fall under our broad classification of “Black”. Born to Pharoah Ramses the II in the fictional state of Kahndaq he grew up to become his high priest. When the wizard Shazam needed a successor for his power he chose Teth because of his inherent virtue and heroism. Shazam’s half demon daughter Blaze subverted Teth’s future by striking a bargain with the God Set so that when he spoke the word Shazam (to activate his power) instead of becoming the avatar of the wizard’s deific patrons, he became the avatar of the Egyptian gods Shu, Heru, Amon, Zehuti, Aton and Mehen. He then served the Egyptian Pharaoh as his champion for many years and even started a family. While away from his home country his family was killed. This event sparked a darkness in Teth as he exacted bloody vengeance on the murderers of his family. Teth continued to serve the Pharaoh but fell from the wizard Shazam’s grace because he became a dictator in Kahndaq after being corrupted by his powers and plotting conquest with Blaze. This lead to his soul and powers being trapped within a mystical Scarab Amulet until modern times. He’s most famous for being the main enemy of Billy Batson/Captain Marvel. Recently he was reintroduced in the Justice League ongoing which debuted under the new 52 banner penned by Geoff Johns. Now he’s classified as black by some but I don’t get why…..help me work this one out logically because Ive always perceived him more as Arabic than black. He’s portrayed as a white guy more often than not but that could just be because Egypt in the mass media, comics included seems to think Egyptians looked exactly like Europeans; what reason would be given for Teth Adam being Black? Sound off below or on our Facebook page! WOW on the feedback guys! Let me see if I understand this. In real world history at the time when Black Adam was supposed to have existed, blacks were the dominant force in Egypt and as the son of a Pharaoh of the times he should at least be part black. + He existed before the Ptolemaic dynasty which is where the European bloodline (light skin) would have entered the royal line of Egypt. There is also no debate that Egypt is in Africa so he can be classified as African but that in and of itself does not make him “back”. I’m also going to check out the JSA line of books where I’m told Adam is portrayed in the past (his original body) as ‘black”. I’ll keep you posted on any further developments! The only reason I could come up with is the darkness of his soul, created when his family was murdered, beyond that like the author I’d just knew him as being Egyptian. I can dig the last line. Thats how I saw him as well. I’ve always seen him as a light-skin African. Much like South Africa or America. Because a lot of people tend to forget that Egypt is still a part of Africa. So technically speaking he IS of African Decent. what part of Africa are you from? I’m from Congo. Where are you from my friend? Egypt is in Africa . I would conclude that the comics industry is well aware of the resurgence of african consciousness in the black community and with the influx of historically white characters who have been remade to be black they’ll put on a black face but continue to have the white writer’s mind behind them. What does this mean? We’ll give you your black hero but he’s still gonna be “OUR” boy. It’s a little jarring to see way too many Black Americans defining other people and cultures based on what they’ve read in a book or watch on youtube, the way they themselves do not want to be defined. Then again, most people think Storm is Kenyan even though she was born in upstate New York to a Black American father and Kenyan mother. If black Adam is from ancient Egypt then he is black. The current inhabitants of Egypt are the descendants of the last conquerors of that land and not only do they come from what is now the Middle East they do not identify with Africa or its ancient kemetic history. I want you brothers to check out two DVD’s, Hidden Colors part 1 and 2. I think y’all might dig it. of us are descendants from the Moors and Dogon people of Mali who he says are descendants of the Egyptians like Benjamin Banneker . Technically he is Black/African. I say technically because the whole time I was growing up, he was White, period. It’s only in recent years they have suddenly darkened his skin and made him appear Egyptian. So yeah you can say he is Black…but personally, he is just some White giy they turned Black because as always with DC, they are too lazy to put in any work when it comes to Black characters. This is a really interesting point. Race is a socially constructed concept. There has long been a debate about how media depicts the African Diaspora. Egyptians can’t be defined by European standard (or shouldn’t) so Black Adam, and by extension Captain Marvel, should be defined by European features. They should be depicted in a way that reflect the diversity of identity found in Africa. “But he’s from Kahndaq!” some would say. Really? What’s Kahndaq? Is it far enough from where Egypt currently is to be a wholly different genetic stock? Are we forgetting that even the Persians of the period were darker than Wesley Snipes and had nappier hair than W. Kamau Bell? Moreover, Kahndaq has been shown to have *many* Kemetic influences, so if the spinoff Kemetic colony Khart Haddas (Carthage) all the way over in what’s now Tunisia was still a nation full of people who looked like the Goodie MoB, then somewhere closer that clearly was following a direct Kemetic path, would be as well. Those nations didn’t really become “Arabic” for many, many centuries after that. 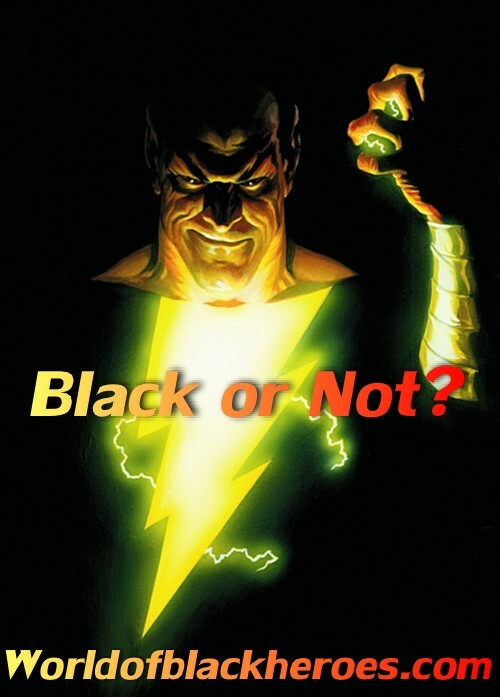 Black Adam, by any logical standard, *should* be Black. DC has decided to make him Arabic, whereas the original comics clearly showed him as just plain white. Eloquently put as always Hannibal! 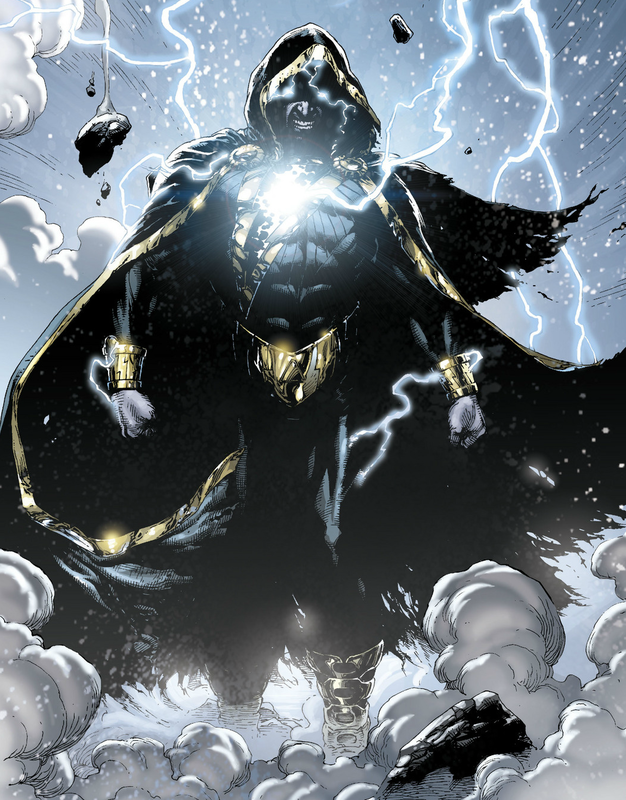 Black Adam is from Kahndaq, which is located near Egypt in the D,C. universe and that’s in Africa and he’s of African descent so I guess that technically makes him African! In his earlier incarnations he was white which was standard practice for that era. More Recently D.C. tried to be more realistic and make him look Arabic do to his place of origin. However, for the sake of argument he’s African. Born near Egypt and of Egyptian descent so he’s black people!